the tall beaker with wide flaring mouth and splayed foot, finely cast on the raised central knop with two taotie masks each made up of a pair of kui dragons with round bulging eyes confronted on and divided by thick notched flanges, above a recessed plain zone with two 'bowstring' lines interrupted by large cruciform apertures, the base decorated with a similar frieze of kui dragons with protruding oval eyes confronted on and divided by notched flanges to make up taotie masks, the flaring neck with rising blade-shaped panels decorated with inverted taotie masks above a band of profile dragons, the main elements all reserved on a ground of sharply cast leiwen spirals, and elaborated with intaglio linear and scrollwork detailing throughout, the bronze of unusually high tin content with silvery gray patina and lightly encrusted with bright green malachite corrosion widely dispersed all over and interspersed with areas of blue azurite, the underside of the foot with a deeply cast large pictogram. 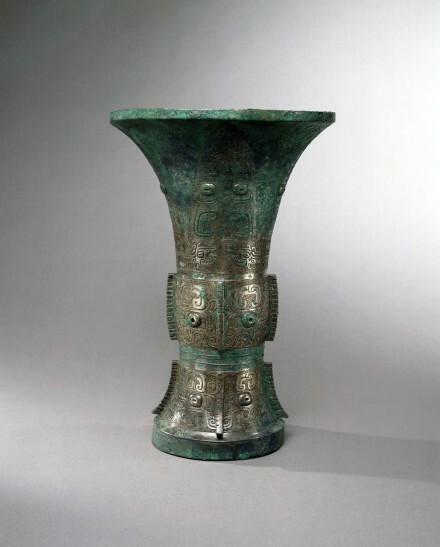 Compare the Shang bronze zun of similar proportions and with a closely related decorative scheme illustrated by Bagley in Shang Ritual Bronzes in the Arthur M. Sackler Collections, Washington D.C., 1987, pp. 282-283, no. 46.